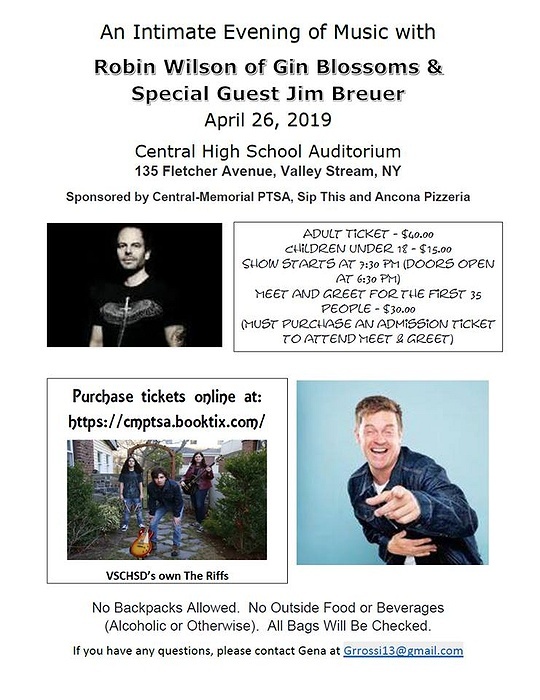 Subject: LongIsland.com - Your Name sent you Event details of "Robin Wilson of Gin Blossoms w/ guest Jim Breuer"
Join us for an intimate evening of music and comedy featuring Robin Wilson of Gin Blossoms and special guest, comedian Jim Breuer! Limited meet and greet tickets available. The purchase of a Meet and Greet includes a picture with Robin and Jim, as well as Prime Seating....Meet and Greet ticket holders must be at the front of the auditorium by 6:15 pm.....To attend the Meet & Greet, you must also purchase a General Admission. Space is limited. Student discount tickets can only be used by those 18 and under. Students must be accompanied by and adult. Student discount tickets will be marked accordingly. Adults will not be admitted with a student ticket. (Alcoholic or Otherwise). All Bags Will Be Checked.